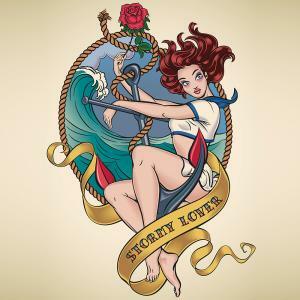 Anchor tattoos, long a favorite of sailors, have gone mainstream, and they signify a lot more than a love for the sea. 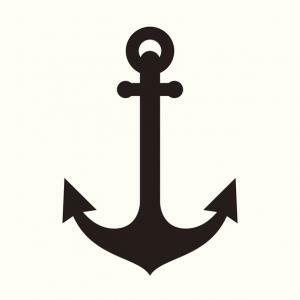 If you're thinking about inking an anchor, explore their many designs and meanings to find the hook that suits your style. During World War II, American sailors and soldiers took their R&R in Hawaii, where a tattoo artist named Norman Collins reinvented the art of ink. Collins, a former Navy sailor, studied the intricate techniques of the Japanese tattoo masters and adapted them to his own brash American style. He used bright colors, bold lines and evocative icons for an enduring, cartoonish look that decorated the arms, shoulders and backs of American servicemen. Sailor Jerry anchors are multicolored and shaded for a sense of dimension, embellished with swallows, splashing waves, rope hawsers, name banners, luscious babes or military insignia. Old school tattoos in this style are always popular. Anchors represent security, strength and staying power. To sailors, an anchor was a logical symbol of stability and seafaring adventure - the two poles of their existence. An anchor entwined with an undulating banner proclaiming "Mom" or a sweetheart's name was a sentimental convention that survived as a retro, tongue-in-cheek style. An elaborate, multicolor, full back or full calf illustration might incorporate ships, mermaids, sea creatures, skulls, eagles, dragons, or inspirational words or phrases. For those who preferred swagger, sweet or seductive mermaids perched in the curves of an anchor were bewitching or bawdy sea beauties. 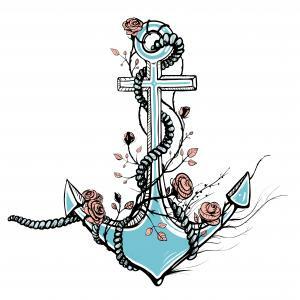 But above all, an anchor tattoo, in an uncertain world, was an emblem to hold you steady. A small, black, line-drawn anchor could be inked behind the ear or on a wrist, ankle or the back of a neck. 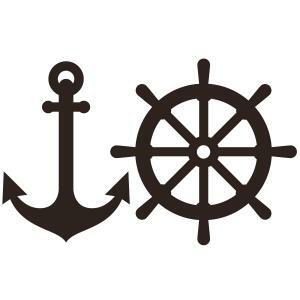 It's a sleek, simple icon that indicates courage, resilience, determination, a connection to the sea, or just an appreciation for a traditional tattoo design interpreted as cool, low-key self-expression. A plain, line-drawn black anchor looks like a ring on a finger. A black-gray monochrome arm anchor, wrapped in a banner with a loved one's name, declares undying affection - and can be covered up for work. A discreet anchor tattooed on the side of the heel just under the ankle bone is hidden by shoes and socks in winter but visible and flirty at the beach. 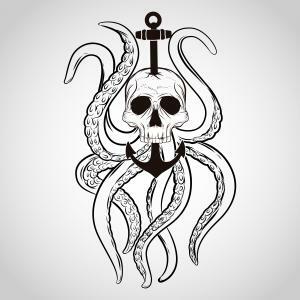 Display your dark side with an ironic or ominous goth-style anchor tattoo centered on a skull, pierced by an anchor and encircled by the waving tentacles of a sea monster. Add a pirate's hat to the skull for something a bit more jaunty. Goth tattoos are typically all black but may be colored as long as the outlines are black. The subject is heavy, like that anchor, and evokes the dangers of the sea with iconic touches such as the skull, pirate gear or a giant squid to underscore the shadowy nautical theme. This is a tattoo you'll want to show off on a forearm, the top of a foot, or the upper back at the neck. The anchor that commemorates a personal epiphany, a life challenge, or an aspiration combines a word or aphorism with the symbol for hanging on and strength. Text woven around or bannered over an anchor might read "Courage," or "Sail Away," or "I refuse to sink." An important mentor's name might serve as a reminder of the person who was there during a pivotal time or who inspired a life direction. Anchors are symmetrical, so a memorial or motivational anchor image works well on a midline such as the center of the chest just below the clavicle, or centered on the back with the stock (top cross bar) just under the shoulder blades and the arms and flukes (the bottom curve and hooks) low on the hips. Anchor tattoos have been around for thousands of years as codes and as signs of religious commitment. Early Christians were persecuted and had to develop clandestine ways to declare their faith and recognize one another. An anchor tattoo was a symbol for the cross of Christ, disguised as a simple nautical design, that discreetly signaled a fellow believer. Today's version of the Christian anchor-cross might feature a delicate hand-drawn garland of roses that signify both love and the legend that roses grew on Calvary after the crucifixion. Maori, Hawaiian and other tribal body art is at least 1,000 years old and usually features black designs with clean and sculptural lines that curve and blend into intricate patterns. The word tatau comes from roots that mean "strike to completion" and "to anchor or moor a canoe." Original tribal tattoos -- tatau -- represented formally coming of age and covered large sections of the body like the entire lower torso and legs, faces, arms and hands. These were bold, abstract shapes that represented the life and mythologies of island cultures. Anchor tattoos in tribal style are spare, assertive and flowing and may be part of a larger, more complex pattern. Getting a tattoo was a rite of passage for sailors who made the crossing from continent to continent, or for Navy seamen who spent their careers on ships. Anchors are powerful and steady and they send an unmistakable message of seafaring expertise. 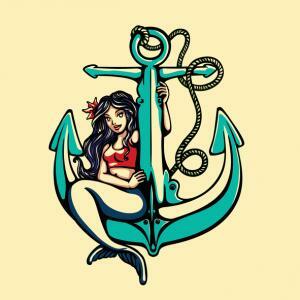 That symbolism is one reason anchor tattoos are still in demand. There's a sense of adventure implied by anchor ink. But that freedom is tempered by what an anchor does: it holds you fast. 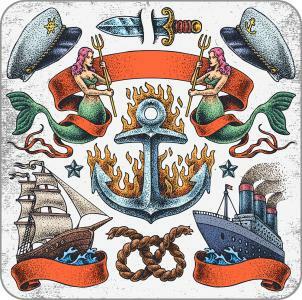 Early 20th-century sailors wore their tattoos as emblems of ocean-going experience and escapades in their ports-of-call. Today, committed partners choose matching or coordinated tattoos to declare their unbreakable bond, and anchors are a popular theme. Some couples select spare, identical anchor tattoos. Others may choose a "feminine" version with intertwined flowers and a "masculine" version with eagle wings or a length of braided rope or anchor chain. A double message is conveyed by an anchor for holding fast and a ship's wheel for charting the direction of life's journey. Commitment ink is commonly placed in clear view, frequently on ring fingers or on the edge of the hand so the images are side-by-side when couples hold hands. 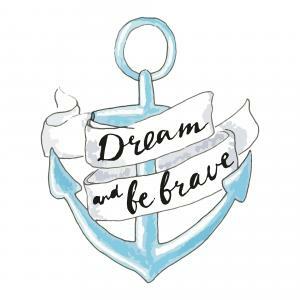 Your anchor tattoo tells a story about you. That story may be as intricate and complete as an elaborate fantasy inked around a ship's hook and filled with flowers, monsters, myths and memories. Or it may be the briefest of introductions, a hint of depths and daring revealed in the spare outline of a miniature anchor that invites further scrutiny. Use these styles to inspire your own custom design.